Attached is a photograph of Cllr Cadogan Enright with the leaders of Downe Urban Sports Association Matthew Kennedy front and Kris Burke centre at the Saint Patricks Centre. Independent Downpatrick Councilor Cadogan Enright has helped local young people involved in ‘Urban Sports’set up a club and seek funding for a Downpatrick-based based facility for sports like BMX or Skateboarding. Cllr Enright chaired a meeting that had been organized on Facebook, where they ratified a constitution, elected a committee and applied for membership of ‘Sported’ to train them how to apply for grants. Matthew Kennedy agreed and said “The whole complex in Dunleath Park is being rebuilt at the moment. There must be somewhere our sports can be fitted in in this huge development. There appear to be several areas of derelict land on the site. We want Council management to meet with us to discuss this and to help us apply for funding to Sport NI and the lotto-run ‘Awards for All’”. jan 22 2014 coney island roads floods, a photo by CadoganEnright on Flickr. 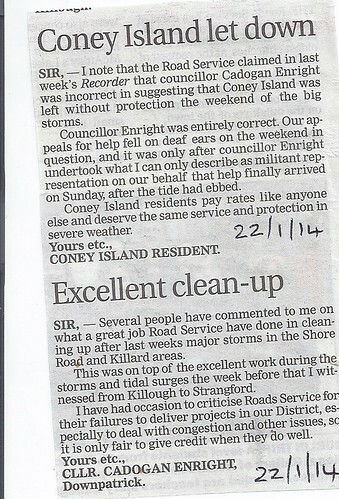 During the recent storms I discovered that Coney Island village was being excluded from emergency flood protection as the Roads Service did not regard Coney Island Road as one of their roads – and the Council was slavishly following the Roads Service in deciding who it would of would support. You can help me raise water purity standards on our local beaches this year by simply taking photos when you are at the beach during 2014. To get the highest standards of water purity in our local beaches, we have to be recognised as ‘Bathing Waters’ under the EU directive – and need to back it up with photos showing the beaches are used for walking, bathing and family outings. Only photographs from this year’s bathing water season onwards can be considered. There have to be a minimum of 45 bathers on one occasion or 100 beach users on two occasions. If you or your family can organise pictures like this (bring 45 friends – I am!) then email, Facebook or post them to me as part of this campaign.